July 2004 – Ben Boyle lives here! I am officially excited. This Saturday, the 31st of July, Brendan turns 11. If you know your Harry Potter, you’ll quickly realise the significance of this date. For some time now, my wife has been organising a Hogwarts celebration. For months in fact. The preparations have been stacked in various locations around the house and more recently, the owls have been arriving with notices of acceptance from the guests. Magic will happen. I really must get my wife to start a blog about party planning because she is mighty good at it!! Updated 11 September 2004: photos are now available. will I ever escape dialup? I really don’t like Telstra (for those that don’t know, they have a bit of a stranglehold on the telephone system in Australia). Dialup internet is limited to 31.2K (even on a 56K modem) because our phone line is “pair gained”. I think that’s the technical term for screwed (at least, for internet access). It also means DSL broadband is not available. There’s no cable. Options are really limited. So I thought to try something different: wireless broadband. And we did it. Last Monday, an antennae was put up on the roof which points at a repeater station on a nearby mountain. That connects into the Internet at some stage, and we’re connected into it all through the network. Doesn’t use the phone line at all! Quite expensive to install, but worth it for broadband. Or so I thought — results have been mixed. Ping times are great (much faster than my dialup connection), but there is a lot of packet loss. I contacted the helpdesk on the third night and was told they have outgrown their capacity (too many users, not enough bandwidth to share around). They have upgrades planned to fix that. And I really hope they do, and soon. Posted on 25 July 2004 Categories Uncategorized2 Comments on will I ever escape dialup? Irwins have accomplished. If you haven’t been, why not? We finally found Hound! Just in time too, before the Kmart toy sale finishes. 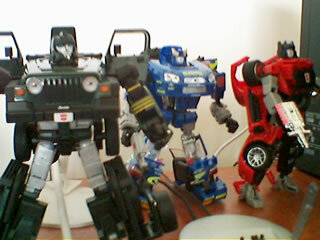 For those who don’t know what a hound is, in this case it is a classic Transformer reinvented as a Jeep Wrangler as part of the Alternators line. That brings my collection to three … a good start! When it’s an associated unit! Posted on 15 July 2004 Categories Uncategorized1 Comment on When is a school not a school? Tonight I tried to pay the ATO $27 GST, which is their profit for me selling web design services. It is really hard to find out how to actually pay the money. Search the ATO site for “pay GST” and you’ll get no results. Anyway, I tried their business portal thingo and found the BPay details eventually. Tried it through netbanking and it looks like it’s been paid (it’s been debited from my account and listed as a transaction!) but when the actual payment was processing it came back and said Your request has been rejected. Confusing!